There are a variety of ways to get involved with the Climate Action Collaborative. To achieve our Collaborative goals individuals and businesses all need to take small steps, together, to help us reduce carbon emissions 25% by 2025 and 80% by 2050. It’s easy, promise. Together we will take small steps everyday to reach our goal of reducing emissions 25% by 2025 and 80% by 2050. Take the Climate Action Pledge HERE. We post frequent updates about actions being taken in our community and tips and tricks for reducing your carbon footprint. Sign-up for the Climate Action Collaborative blog HERE. Our monthly newsletter details actions being taken by each working group of the Collaborative and upcoming events and opportunities to get involved. You can view past newsletters here. Join the Climate Action Collaborative email newsletter HERE. Sometimes it’s difficult to know where to start. Try calculating your own carbon footprint to determine areas you and your family can personally work to reduce your own emissions. Calculate your own carbon footprint HERE. 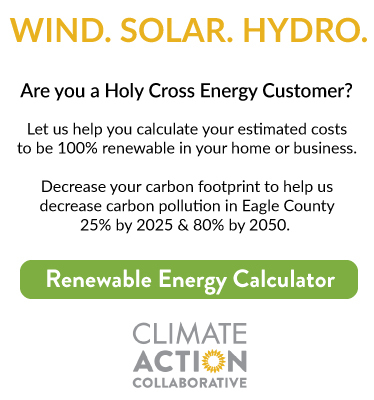 Buildings in Eagle County account for nearly 60% of total carbon emissions in Eagle County. Consider having Walking Mountains Sustainability and Energy Smart Colorado conduct an energy audit of your home to help you identify areas where you can improve efficiencies to help us to meet our Climate Action Collaborative Goals. Learn more about home energy audits HERE. The Actively Green program in Eagle County can help to engage your employees in sustainable business practices, teach you how to make sustainability actionable in day-to-day operations and will help you to create an action plan to drive success. Even if you do not own your building’s business location, or do not own the business you work for there are opportunities to help us achieve our Collaborative goals of reducing emissions. Learn more about Actively Green HERE.